I like snacking. I like fruit. And I hate spending money. At the tail end of the season (now) strawberries, blueberries, and raspberries are hanging out in your grocery produce section at clearance level prices. With a dash of lemon, a pinch of sugar, and some dry heat, those peaked berries can reach their full potential. And, yes, you can make this with you kids. I don’t have kids. It’s a recession, pay hasn’t nearly caught up with inflation, and there’s no way in hell I can afford spawn. So, I’m making fruit snacks for me and me alone. 4 cups fruit, roughly chopped. I used a mix of berries, but you can also use apple and pear. If using apples and pear, be sure to peal them and omit the orange marmalade and vinegar. 2 – 3 TBSP sugar. I’m into flavor, not “sweet”. As the fruit dries their natural sugar is going to intensify, so add what you think is best, taste your fruit mixture prior to drying it, and add sugar as necessary. 1 TBSP freshly chopped mint. If you don’t have a dehydrator (I don’t) preheat your oven to 125-150. My oven starts at 200 with a “Warm” setting just beneath it. I set it to “Warm” and stuck a spoon in the door to keep the oven cracked. Your not cooking the fruit mixture; you just want to dry it out. In a sauce pan mix the fruit, water, and balsamic if using over medium high heat. Simmer for 10-15 minutes, until the berries soften significantly and thicken slightly. Turn off the heat. Add the marmalade and sugar, mixing until incorporated. Add the mint and blend the entire mixture in a food processor or with an immersion hand blender until mostly smooth. Cover a cookie sheet in wax paper or plastic wrap. I wanted a thicker fruit leather so I covered a large Pyrex dish in plastic wrap. If you want to roll them up for lunches, use a cookie sheet. You’ll be able to roll up the fruit leather with wax or parchment paper to snack on later and what kid wouldn’t think that it’s totally awesome to have a fruit rollup at lunch time that they themselves made?! Pour the fruit mixture into the cookie sheet or pan using a spatula to make sure it’s even. Your mixture should be 1/4-1/2 inches thick. Place on the top shelf of your oven and forget about it. It’s going to have to dry out for at least 6 hours, but it will probably take closer to 8-12 hours. You’ll know when it’s done because the top won’t be sticky. Let cool and the cut (it was easier with scissors than with a knife) into the size you’d like you snacks to be. The edges may be a little crispy; just cut those off and sprinkle over a salad later. You can roll them up with wax paper to snack on throughout the week. Next time I make these I’m going to substitute the water with a red wine. If anyone does this, let me know how it turns out. 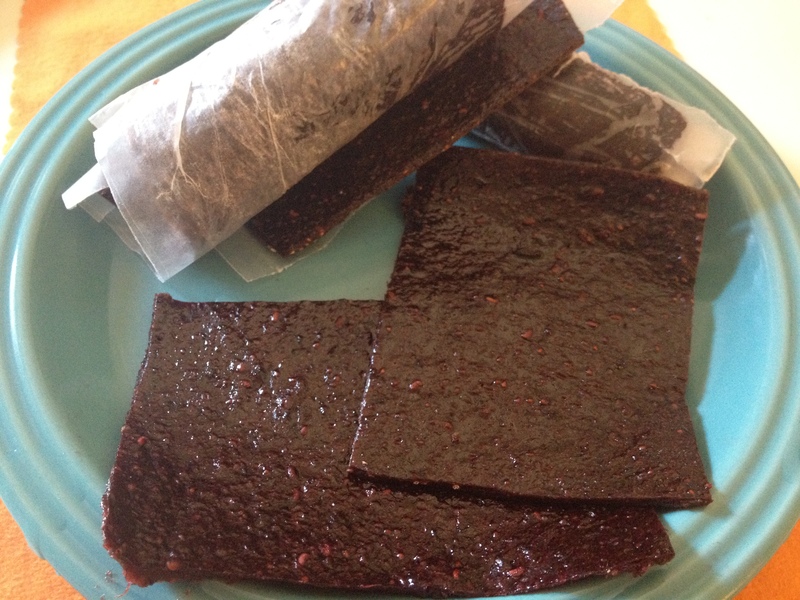 This entry was posted in Food, Recipes and tagged berries, cooking, diet, family, fruit, fruit leather, fruit rollup, healthy, kids, low calorie, recipe, recipes, roll-up, snack, snacks, summer, vegetarian.